The 2015 CCSC Distinguished Service Award was presented to Elizabeth S. Adams at the CCSC Eastern Conference held November 14-15, 2014 at York College of Pennsylvania, York, PA.
Elizabeth or “Liz” Adams began serving on the conference committee for Eastern conference during the first few years of its existence as Eastern Small College Computing Conference. She served as the first regional representative to CCSC for the Eastern Region and continued in this role through the 2013-2014 school year. Liz worked diligently to promote the Eastern region. She has always been concerned with the health and future of the Eastern region. Known for her energy and ability to “tell it like it is”, she is respected and appreciated by the members of her region. She is known for her “persuasive powers” in recruiting locations and site chairs for future conferences. Her working knowledge and history of CCSC has been a valuable resource for planning and carrying out conferences. Liz has always looked for ways to improve the quality of the conferences. She has also taken care of those that volunteer to help. One example is that she writes letters to the administrations of the colleges that host, thanking them, and commending the faculty organizers. In addition to representing her region she has also devoted her attention to the concerns of CCSC as a whole. She regularly attended CCSC board meetings always willing to offer insights. As regional representative she worked to avoid scheduling conflicts with other regions. On the CCSC board she served as the liaison to Upsilon Pi Epsilon. She has actively recruited for CCSC over the years including during SIGCSE conferences. For over 25 years Liz has faithfully served CCSC and the Eastern Region. 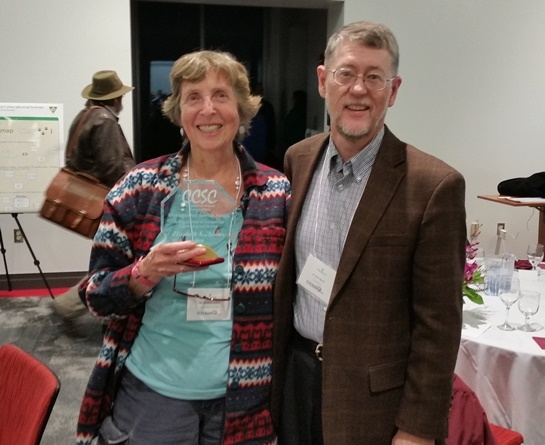 It is with great pleasure that we present the 2015 CCSC Distinguished Service Award to Liz Adams.